The industry's strongest outdoor and indoor pest repeller. 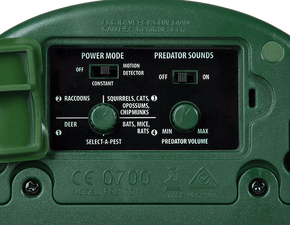 The Guardian is a humane and eco-friendly device that keeps animals away from your property using special frequencies of high-pitched sounds. Those unwelcome guests will become so annoyed and disoriented from this unpleasant noise, they'll leave and never want to return. If you're tired of seeing your yard & garden destroyed by pests, The Guardian™ is your solution to keep them away for good. And if you have any questions, we are available by telephone, live chat and email whenever you need it. Target the exact pest you want to repel using the frequency they'll find most irritating. Storms and sprinklers are no problem for the Guardian's IPX4 waterproof rating. Sit back and relax while The Guardian protects your property, inside and out. Prevent expensive squirrel damage in your attics, garages, and other storage areas. Stop those hungry neighborhood deer in their tracks. Keep the local raccoons from using your yard as their bathroom. Operate your Guardian using (6) C-batteries or the included AC adapter. This allows more flexibility to install the device where you want based on your unique situation. With its durability and multiple power options, The Guardian can be installed anywhere you need it. There's even an optional Pan & Tilt Mounting Bracket. The new Guardian uses a highly specialized thermal sensor that recognizes movement by picking up changes in heat. This allows the Guardian to activate with the slightest movement of pest animals or people within 60 ft of the unit – while at the same time preventing false activations like leaves blowing in the wind. With our innovative predator call feature, drive away deer, elk, raccoons, and more using predatory wildcat growls. Frighten and disorient pests using the calls of their natural predator, causing them to seek shelter elsewhere. The detachable strobe light is particularly great for bats, deer, and other pests that go bump in the night. Run it in tandem with your Guardian’s sounds, or leave it off altogether. The choice is all yours. What pests does the Guardian work for? The Guardian can repel many types of animals including armadillos, bats, deer, mice, opossums, raccoons, rats, skunks, and squirrels. Results can take 2–3 weeks. Note: Be aware that under some situations of extreme drought or other adverse conditions, the pressure on any creature becomes so great that survival overrules any deterrent. What pests are NOT repelled by the Guardian? The sounds emitted by the Guardian do not typically repel insects or birds. Does the Guardian kill any pests? The Guardian is not designed to kill pests. It is an electronic device that will help repel the unwanted pests and give you a peaceful, damage free home or lawn. How do I set the Guardian to repel different types of pests, such as squirrels, bats, rodents, etc? How does the motion-sensor work? What else might cause the unit to activate? The Guardian detects motion by using a specialized thermal sensor that detects small changes in heat in front of the unit. This means that an animal moving within 60ft (18m) of the Guardian can cause shift in the level of heat in the area and cause the device to activate. Certain animals (like mice or rats) may be too small to generate enough heat to activate the Guardian when on a motion setting. In those situations we would recommend using the continuous sound setting rather than using the motion sensor to activate the sound. In some cases, sources of directed light (like flashlights or car headlights) aimed directly at the unit can contain enough infrared light to activate the unit. Nearby mirrors can also reflect infrared light, potentially causing the Guardian to activate. Keep this in mind when choosing where to set up and install the Guardian. Where should I place the unit for best results? Place the Guardian in a central, open area so the sound frequencies can be projected as far as possible. This unit can be mounted on the side of a wall by hanging it from the mounting holes on the back of the unit, or you can place this unit on any type of a flat surface. Can I use it under my house? Yes, this unit can be placed under your home. As long as your home is no larger than 6,000ft2 (560m2) one unit should be sufficient. The optional strobe light is highly recommended for repelling pests such as squirrels, raccoons, and bats in dark areas. Will the Guardian bother my pets? Your pets may be able to hear some of the frequencies projected from the unit. However, if the unit is outdoors and the pets are indoors, this unit will not bother them, as the frequencies will not go through any solid objects such as walls. Can one unit cover my entire attic? As long as your attic is one open room, no larger than 6,000ft2 (560m2), one unit will be adequate to cover your attic. The optional strobe light is highly recommended for repelling pests such as squirrels, raccoons, and bats in dark areas. If I have pests in both my front and back yard, will I need 2 units? The sound frequencies can not go through any solid objects such as walls. You would need to place one unit in your front yard, and one in your back yard. Will I or my neighbors be able to hear it? The lower settings on the unit are audible. When set to a higher setting, you will not be able to hear the frequencies. What is the optional remote used for? If a pest is just outside the range of the motion detector, or a pest too small to activate the unit is lurking around your yard, you can use the remote control to manually activate the unit. This the sound frequencies up to 100ft2 (18m2) away. Works great as a replacement or spare for The Guardian™ or UltraSweep Outdoor™. 5 Feet in length.